At the 2018 American Hospital Association (AHA) Leadership Summit in San Diego, California, the Health Dimensions Group (HDG) team sat side-by-side with our hospital clients and partners as they addressed the challenges hospitals are facing. Some of these challenges are value-based payment, consumerism, and the drive toward population health. The sessions were a call to action by providing inspiration and sharing examples of innovation and partnerships. 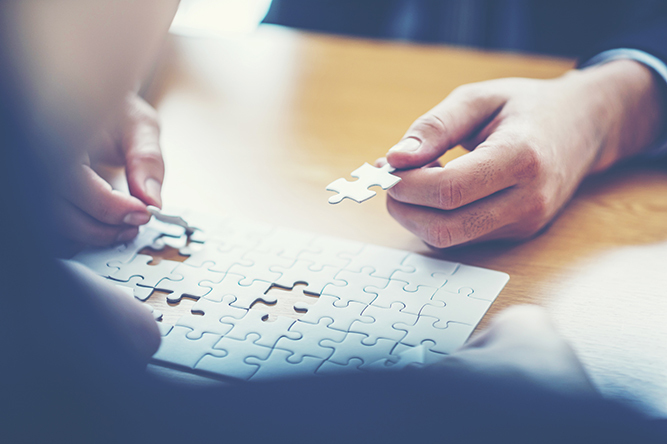 As a post-acute, long-term care, and senior care provider and a consultant to organizations across the health care continuum, HDG has a unique perspective on these challenges and how they affect the relationship between acute care providers and their post-acute care partners. Hospitals and post-acute care providers are in a symbiotic relationship: Hospitals rely on post-acute care providers to provide high-quality and cost-effective care; and post-acute care providers rely on hospitals for the majority of their referrals and for clinical support to their residents. Hospitals and post-acute providers care for many of the same patients, face the same challenges, and are tasked with the same goals. But, they speak a different language and are incented and reimbursed very differently. During our travels throughout the country speaking to providers across the continuum, we hear about four top trends. 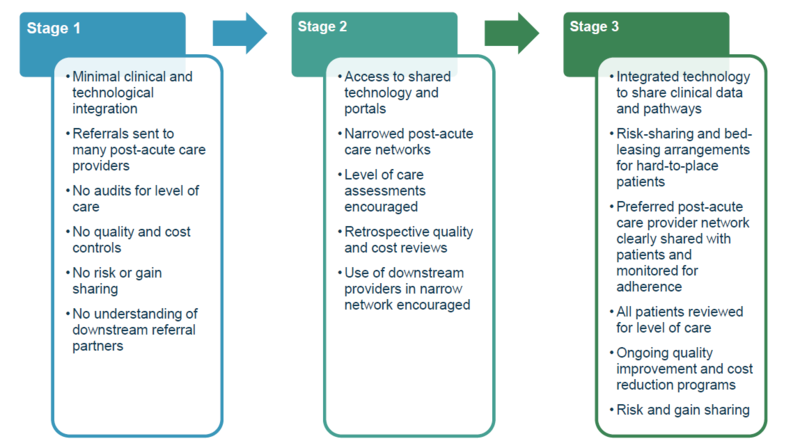 As confirmed at the AHA meeting, acute care providers are in different stages of acute and post-acute care integration, with most being in the first part of stage 2 and very few in stage 3, as identified in the figure below. Hospitals should define and implement a post-acute strategy that better positions the hospital for success in a value-based, risk-driven, and highly competitive market. Hospitals with post-acute assets must ensure that operational and clinical integration is in place and that the benefit of the asset is accurately captured, including cost allocations and system savings realized through these operations. 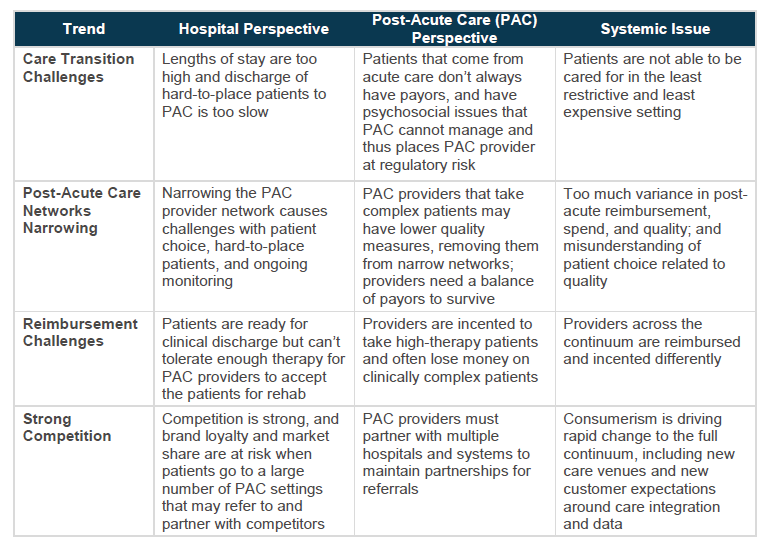 Whether or not the hospital has a post-acute asset, the hospital should develop formal relationships with community post-acute care partners to achieve mutual operational and outcome goals, including moving to risk-sharing arrangements with post-acute care when the hospital is at risk through health plans, accountable care organizations (ACOs), or bundled payment programs. Post-acute care providers should work to improve quality, integration, and outcomes and clearly communicate these to hospital providers. Post-acute care providers who are able to demonstrate consistent, lower cost, high-quality care should propose risk sharing with acute care providers at risk through health plans, ACOs, or bundled payment programs. HDG can help hospitals and post-acute care providers in developing successful partnerships. You can reach us at 763.537.5700 or info@hdgi1.com.